Daleys Fruit Tree has Plants for Sale to Lindesay Creek and can Mail Order them to you door. Click to Find out how much Freight Will Cost. This tall shrub or small tree flowers in its third year. 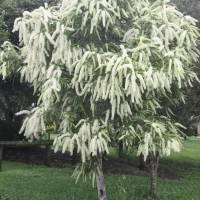 It is often grown as a street tree or specimen where its sweetly scented cream flower spikes can be appreciated. Retains its compact shape when grown in full sun. Frost tender when young.